Looking for that unique gift or the unusual. Our Romantic Gift Ideas for Him and the selection of Romantic Gift Ideas for Her with our Message in a Bottle which are all handcrafted by our staff within the USA offers you a wide selection to choose from know matter what the occasion. Our Romantic Gift Ideas opened up a brand new way to express yourself. 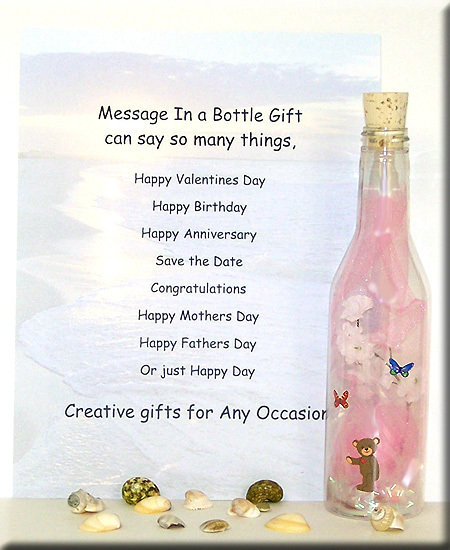 When Romance is in the air or just to say I love you our Romantic Gifts and Message in a Bottle will help you say what ever needs to be said. Gift Ideas for all occasion and Unique Gift Certificates that will spice up any occasion sent to your recipient whenever you want . Our new shipping date selector allows you to select the day you want your order to be mailed out on so you will never miss any occasion again. Thank you for shopping with Carefree Gifts. We recommend you add your name so the they know who sent this. Stock# - p01014tgs Exclusive: Plastic Message in a Bottle - Welcome or Introduce a new Baby Girl to your Family and Friends in way that will not be Forgotten which creates a Memory and Keepsake for all. 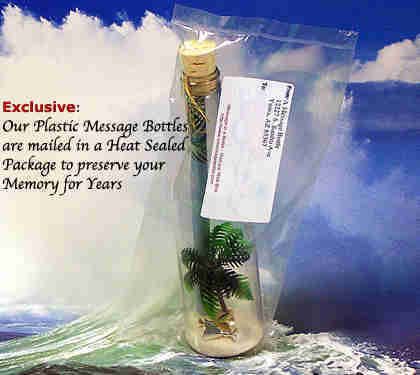 Description: Price includes handcrafted designer plastic Message in a Bottle, dimensions 8.5 inches tall X 2.25 inches wide at the base. Your personalized greeting is elegantly printed on a Scroll you selected from our collection at NO additional charge! NOTE: Ordering more than one of our Gift products? NOW you can provide us with all the mailing information for each item at the time of Check Out.